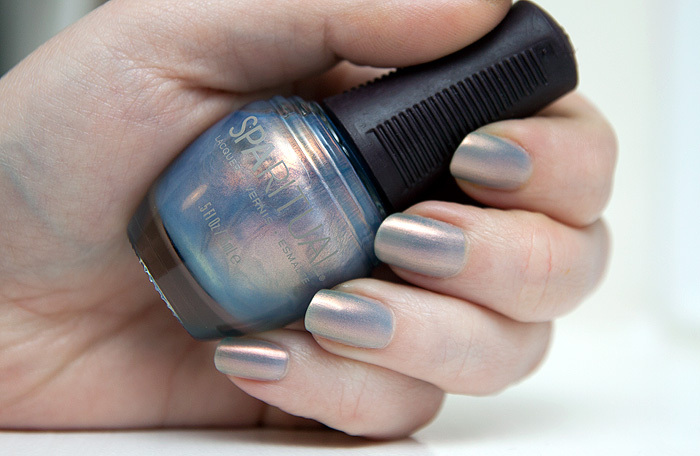 I’ve started delving into my new acquisitions from Pro Beauty and first up is SpaRitual’s It’s Raining Men – a swirl of pastels that look, at least to me, like a big cupcake-y nebula. Three coats will give a solid opacity, I was expecting to need more for this kinda of multi-chrome paleness but three covers admirably. Any tip wear doesn’t really show too obviously and I didn’t get any chipping after even three days (with a top coat). Oooh pritty, but too pale for my boiled beef lobster handed vileness. Sadly. I have a similar colour from No7 (but I suspect it was a very old LE colour as I have picked it up at a boot sale and havent seen anywhere else, not even ebay/discontinued make up sites),and its undoubtedly pretty, but takes ages to dry and is sheer! To me it looks very much sky with pink clouds that you get at the dawn, so sweet! I love your description, “cupcake-y nebula!” I’ve waffled on purchasing this almost every time I browse bloom.com, this may be the best photo of this polish I’ve seen. What top/base coats did you use? I get shrinking on my SpaRituals and I’m trying to figure out what the culprit is. that is stunning, lemming hard now! Now this is a colour I can get on board with, what a beaut! When I was a small human, my parents used to respond to questions like ‘what colour will it be?’ or ‘what colour was it?’ with the answer ‘sky blue pink with yellow polka dots’. I do believe this is EXACTLY what they meant by ‘sky blue pink’. All this time I thought they’d been taking the piss! see, now you’ve made me want to redo it with some yellow polka dots!! how stunning and UNIQUE is this colour, wow!